Reverend Norma Gean Davenport, the 2005 recipient of the “Pansy M. Brown Distinguished Service Award in Christian Education” by the National Association of the Church of God, has been at the forefront of Christian Education for more than a quarter of a century. Reverend Davenport was the first organizer/administrator of “Christian Training and Recreation Ministries”; Day-Care at First Church of God in Far Rockaway; year-round After School Tutorial Program; Summer Day camp; a Girl Scout Leader and Adult Trainer and Field Representative for the Girl Scouts of Greater New York. served as Sunday School Teacher, Vacation Bible School Teacher and Sunday School Superintendent over a 20-year period, both at First Church of God Far Rockaway, New York and Prophetic Church of God 130 West 129th Street , New York City. She was the last State Sunday School Superintendent under the Ministers and Workers Alliance and the First President of the new Board of Christian Education under the Eastern New York General Assembly. Reverend Davenport has also served as the director of the Summer Youth Delinquent Development with at Hammels Houses Community Center. In 2007, Reverend Davenport, after undergoing an two week mission to Kenya and Rwanda with her husband, Reverend Dr. Arthur W Davenport, and a team of other pastors from the New York area under the leadership of Reverend Dr. Mac Pier of “Concerts of Prayer Ministry”, Reverend Davenport lead a campaign at First Church of God Far Rockaway that sponsors about seventy-five families in Rwanda. First Lady Reverend Norma Gean & Reverend Dr. Arthur W. Davenport share: five children, Cheryl Davenport (Neil) Allmond, Michele Bethea Hilliard, Natalie Bethea (Bernard) Surgeon, Tyrone (Susan) Bethea and Saneek (Latosha ) Beard;grandchildren, Megan, Justin, Blake, Dana, Lewis, Markus (Ashley E. Graves), Darnisha, Tyane, Tenisha (Gerald Preston) and Olyvia & Lauryn Beard; great grandchildren, Mearah, Lyla , Jaylen, Matthew & Gerald Preston and Alayna. 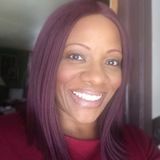 the National Association Women of the Church of God (West Middlesex, PA); Board member of The Christian Women Connection (Anderson, IN); Praise & Worship Leader; Church Secretary; Adult Sunday School Teacher; and Evangelistic Christian Bible Institute Instructor. Lady Madelin’s calling is the gift of Helps (1 Corinthians 12:28). Lady Madelin, along with her husband of 31 years, Pastor J-Anthony Dargan, have been blessed to serve as the Senior Pastor and First Lady of the Congregational Church of GOD, Harlem, New York for the past 14 years. They are the parents of two wonderful and magnificent children: James Anthony and Christine Jannie-Lorraine. “The Blood of the Cross” (Colossians 6:14) Stephany A. Bannister was born and raised in Brooklyn, NY to Guillermo and Ana Fisher. She is a self-described “foodie” due to her love and passion for food. As a result she pursued a career in the Foodservice Industry. She holds a Bachelor’s Degree in Hospitality Management and Culinary Arts from New York City Technical College and currently works for the Oﬃce of Food & Nutrition Services as a District Supervisor; ensuring that the students of NYC are provided with healthy and nutritious meals on a daily basis. She has served Grace as an usher, Sunday School teacher and youth leader. At the present she uses her passion and love of food as she serves in the Hospitality ministry at Grace. She also serves as a Worship leader and leader of the Prayer ministry. Her heart’s desire is to see people’s lives transformed through the power of prayer; exalt the name of Christ through worship and serve God’s people in love. She is married to Rev. Carlos W. Bannister and together they are the proud parents of 3 daughters: Alana, Layla and Zoe. 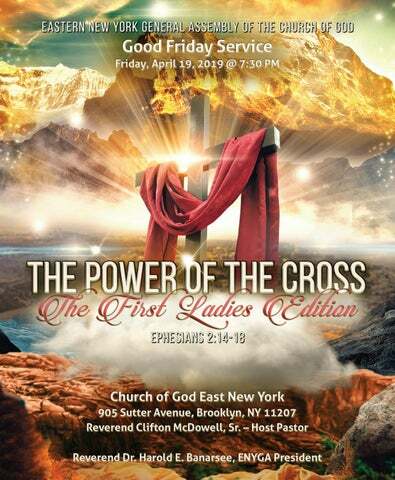 “The Fellowship of the Cross” (Philippians 3:10) Deborah A. McDowell is the First Lady of The Church of God East New York located in Brooklyn New York, where she has served in various capacities since 1981. Lady Deborah holds a degree in early childhood education, and also obtained a Diploma in Biblical Counseling from the American Association of Christian Counselors. (AACC) Lady D as she is affectionately called has a unique ability to communicate truth creatively to challenge people to live out their faith. Working alongside her husband Clifton McDowell Sr. in ministry for the last 38 years she has proven to be a woman of wisdom and insight as she loves and cares for the people of God. Helping to provide leadership to the congregation through Life Care Small groups, counseling, teaching and leading couples to deepen their marital covenants. Her focus currently is helping to lead the ENY Women of Faith ministry and serving by teaching as part of the ENY Church of God discipleship training staff. Together Lady Deborah and Pastor Clifton have 4 children and three grandchildren. “The Triumph of the Cross” (Colossians 2:15) Pastor Tatum M. Osbourne is a worshiper, wife, executive pastor and preacher with a heart to see people reach their God-given destinies. She is an ordained minister of the Church of God Reformation Movement (Anderson, IN). For over twenty years Pastor Tatum has been actively involved in ministry. A native of the beautiful island of Barbados, she was raised and educated in Brooklyn, New York. Pastor Tatum studied Christian Ministry at Mid-America Christian University (Oklahoma City, OK). When you meet Pastor Tatum, you will know her message is something she lives in her daily life. God has gifted her with the ability to take listeners through the scriptures, causing the Word of God to leap from the pages, and challenging them as they never dreamed possible. She is blessed to impart words of healing to men and women at various churches, conferences, workshops, and other ministerial outlets for the glory of God. Pastor Tatum serves as the Executive Pastor and leader of the women’s ministry of the Refuge Church of God located in Bedford-Stuyvesant section of Brooklyn, NY. Pastor Tatum and her husband Pastor Kevin Osbourne established TKO Ministries; the God-ordained vision for this ministry is to be an extension of God’s love in the earth through the preaching and teaching of the Gospel of Jesus Christ, the equipping of believers for ministry and holy living, caring for the poor, underprivileged, forgotten and marginalized of society and any other avenue by which to spread the good news of Jesus Christ. Pastor Tatum also serves the Eastern New York General Assembly of the Church of God as the Financial Secretary. In 2015, Pastor Tatum became a published author with the release of her first book entitled, The Inspired Life: 400 Power Thoughts to Inspired Your Life. She is currently working on her next two books, Let It Go and Defy The Odds. Pastor Tatum and Pastor Kevin have been married for twenty years and they reside in Brooklyn, NY. EMPIRE STATE MARCH All clergy are asked to march with a special offering of $100 on Sunday, the last day of the convention to alleviate expenses and costs.